This collection wraps up the end of legendary Jack Kirby run of the mid-1970s. But before he goes, Kirby gives us another of his wacky character creations with Arnim Zola, the would-be conqueror who’s mind has been transferred to a robot body, which has a TV screen in its chest displaying Zola’s face. Zola was a Nazi biochemist who escaped capture at the end of World War II. If you are a long-time reader, you know that any time Captain America comes into contact with a former Nazi, that the Red Skull cannot be far behind. The Kirby run comes to an end with Captain America Annual #4, which has Cap facing off against another one of Kirby’s great co-creations, Magneto! Considering that one of these characters has powers of magnetism, and one of these characters carries an adamantium shield, well, it’s not looking good for our hero. Following the obligatory reprint issue or two to recount Captain America’s origins, we are treated to a visit by Nick Fury and S.H.I.E.L.D. The spy organization has been recruiting a new team of super agents, but the squad needs a leader. Naturally, Nick believes that Steve Rogers is the man for the job, but Steve has a better suggestion. He proposes that the Falcon take on that task. He’s been working with Cap for many years and is ready to be a leader in his own right. So Captain America and the Falcon go their separate ways, but the two will find ways to reunite in the years to come. So Captain America is once again working solo, but that doesn’t mean he is alone. We are treated to numerous appearances from the Avengers, and Sharon Carter is by Steve’s side to bridge the gap between his costumed and civilian life. The volume wraps up with a two-issue crossover with the Hulk, making for a pair of characters that we don’t normally see together. It’s a great way to bring this book to a close! What makes this Essential? : This is an interesting transition time for Captain America. Jack Kirby’s run comes to an end. The title seems to have a rotating roster of writers before Roger McKenzie begins a two-year run. Sal Buscema returns to the book, providing some familiarity for the long-time readers. But the biggest change comes with the ending of the Captain America-Falcon partnership, both within the book as well as the title of the comic. Despite all of the changes, this is a solid collection. The Kirby issues in this book are my favorites of his mid-1970s run. Arnim Zola may be one of, if not the last great crazy Kirby concept, who has become a mainstay in the comics and now in the Marvel Cinematic Universe (MCU). Letting the book go back to its singular focus on the title character helps the book, allowing stories to go in different directions without trying to find a way to work the Falcon into the plot. That’s not to imply that I don’t like the Falcon. Just that after being partnered with the Falcon for seven years, having Steve Rogers on his own just offered up fresh takes on our hero. 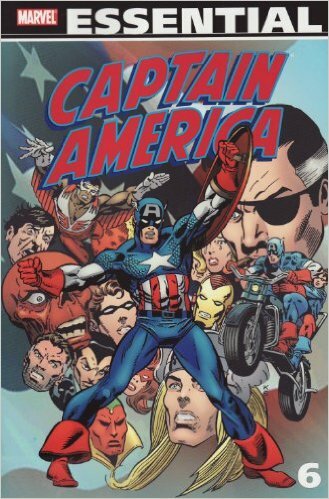 Footnotes: The table of contents is incorrect in this volume, which lists Captain America Annual #4 as being located between Captain America #230 and Incredible Hulk #232 in the collection. The annual is actually found between Captain America #214 and #215, at the end of the Kirby run. Captain America #230 and Incredible Hulk #232 are also reprinted in Essential Hulk Vol. 7. If you like this volume, try: reading up on Quasar. From his humble origins as Marvel Boy contained in this Essential, his stature has grown over the years. He was a recurring character in Marvel Two-in-One with the Project: Pegasus storyline. He was a member of the Avengers, serving a key role in the Galactic Storm mission. He headlined his own title for 60 issues. And he was one of the featured characters in the original Annihilation story, which that event kicked off a series of events that brought “Marvel Cosmic” back into the mainstream. As a result of Annihilation, readers were given a re-introduction/re-imagining of the Guardians of the Galaxy concept which we later saw incorporated into the MCU. The early issues of his solo series were reprinted in 2012 in a Quasar Classic trade paperback. He’s an interesting character that we don’t see enough of anymore, so dive into the back issue bins to find his early adventures. This entry was posted in Captain America, Marvel Essentials and tagged Captain America, David Anthony Kraft, Don Glut, Jack Kirby, Roger McKenzie, Roy Thomas, Sal Buscema, Steve Gerber. Bookmark the permalink.